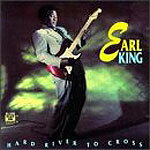 CD review: "Hard River to Cross"
Along with Snooks Eaglin, Earl King is one of New Orleans' premier guitarists. He's been on the scene in the Crescent City since the '60s, his songs have been covered by everyone from the Meters to Dr. John to Professor Longhair, and his guitar solos are as fiery as they come. King's new release should further his reputation both as composer as musician. The songs, all originals, are uniformly excellent and will become part of the New Orleans canon. King's music, like much of what comes out of New Orleans, is equal parts blues and R&B with a strong back beat. (Would you expect any less with former Meter George Porter Jr. on bass?) His playing, on both guitar and  on two tracks  piano, is spirited, funky and, well, New Orleans. On those two piano tracks  "No City Like New Orleans" and "Big Foot"  plus "Seduction," Eaglin sits in on guitar and contributes his usually sharp fills and solos. As a singer, King is on less than solid ground. His vocals are uneven, and one gets the feeling that singing does not come easily to King. But its good enough that it doesn't detract from the overall quality of the album.